Earlier this week, BBC2’s Dead Ringers compared Tony Blair to the bunker-bound Hitler. Another symbol of the PM’s decline in popularity may therefore seem otiose, but that is what the Pet Shop Boys’ ninth album turns out to be. 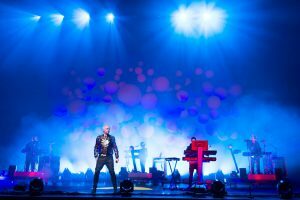 Neil Tennant and Chris Lowe spent election night 1997 not only attending the Royal Festival Hall bash, but also an aftershow party at a Park Lane hotel, where, Tennant remembered, champagne flowed and entertainment was provided by MPs ‘forming the government’. Until recently, Tennant could be relied upon to support the government – initially, he backed the Iraq war – but with Fundamental, things take a disagreeable turn. It touches on regime change, immigration, ID cards and the politics of fear. It features, the PM will doubtless be overjoyed to learn, another in what appears to be a series of Pet Shop Boys songs depicting him as a hapless lover in thrall to a hopeless partner. On 2002’s I Get Along, he was fretting by the phone, waiting for perfidious Peter Mandelson to ring. This time, he’s trying to conduct a transatlantic relationship with a man everyone else thinks is a moron, on the splendidly titled I’m with Stupid. In fact, there is every chance Blair will miss the song. For one thing, he has rather more to worry about than the Pet Shop Boys implying he’s having it off with George Bush. In addition – surprisingly for a Pet Shop Boys single – I’m with Stupid seems to have mislaid its chorus amid the electronic pyrotechnics provided by Trevor Horn, still best known as Frankie Goes to Hollywood’s producer. It’s one of two moments when Fundamental misfires. The other is Numb, the work of songwriter Diane Warren. You can see the conceptual, camp appeal of the perennially poker-faced Pet Shop Boys working with the queen of the blockbusting power ballad, but the result sounds strangely wan. That may be less a reflection on the song itself than the company it keeps. The album’s title seems appropriate: focusing on New Labour’s trials has reconnected the Pet Shop Boys with something of their essence. Their image as pop’s arch-ironists has obscured their abilities as incisive social commentators, but they would dominate any top 10 of Great Songs Inspired by Thatcherism: Opportunities (Let’s Make Lots of Money), Shopping, Rent, King’s Cross. Furthermore, their music had an unnerving ability to find favour with the very people it attacked. You didn’t hear Robert Wyatt’s Shipbuilding blaring from a yuppie’s GTi very often, but you did hear the Pet Shop Boys, possibly because their outrage and scorn was carefully, delicately applied. And so it proves here. Indefinite Leave to Remain is an aching love song conducted in the official language of the asylum seeker. Twentieth Century concerns Iraq, yet it’s really about second thoughts. ‘I bought a ticket to the revolution and cheered when the statues fell,’ concedes Tennant. ‘Everyone came to destroy what was rotten but they killed off what was good as well.’ On Integral, the poker face slips slightly: as he protests against ID cards, you catch the faintest tremor of rage in Neil Tennant’s voice. He sounds angry, a bracing new sensation almost 25 years into the Pet Shop Boys’ career. The reunion with Horn – their first since 1988’s glorious Left to My Own Devices – proves similarly inspired. Opener Psychological sounds subdued: quite an achievement, given that it features an orchestra, a harp and ‘a sample from the recording of the Song of the Most Holy Theotokos for Tatiana Melentieva from the album Svete Tikhiy (O Gladsome Light)’. Its understatement fits the song’s theme of nameless dread, but you have to wait until The Sodom and Gomorrah Show before Horn pulls out what you might call the Full Frankie: timpani, thwacking hi-NRG bass, cascading synth lines, jagged guitar chords and, as was once mandatory on his productions, a booming voiceover that breaks into puny-earthlings-I’ll-destroy-them-all cackling. Employ Paul Morley to write some dada-influenced cobblers for the sleeve and the image would be complete. But it’s a perfect fit, the apocalyptic hedonism of Two Tribes or Welcome to the Pleasuredome updated for a different, but equally paranoid era.